Badrinath or Badrinarayan Temple is a Hindu temple dedicated to Vishnu which is situated in the town of Badrinath in Uttarakhand, India. The temple and town form one of the four Char Dham and Chota Char Dham pilgrimage sites. The temple is also one of the 108 Divya Desams dedicated to Vishnu, who is worshipped as Badrinath—holy shrines for Vaishnavites. It is open for six months every year (between the end of April and the beginning of November), because of extreme weather conditions in the Himalayan region. The temple is located in Garhwal hill tracks in Chamoli district along the banks of Alaknanda River at an elevation of 3,133 m (10,279 ft) above the mean sea level. It is one of the most visited pilgrimage centres of India, having recorded 1,060,000 visits. The image of the presiding deity worshipped in the temple is a 1 m (3.3 ft) tall, black stone statue of Vishnu in the form of Badrinarayan. The statue is considered by many Hindus to be one of eight swayam vyakta kshetras, or self-manifested statues of Vishnu. Mata Murti Ka Mela, which commemorates the descent of river Ganges on mother earth, is the most prominent festival celebrated in the Badrinath Temple. Although Badrinath is located in North India, the head priest, or Rawal, is traditionally a Nambudiri Brahmin chosen from the South Indian state of Kerala. The temple was included in the Uttar Pradesh state government Act No. 30/1948 as Act no. 16, 1939, which later came to be known as Shri Badarinath and Shri Kedarnath Mandir Act. The committee nominated by the state government administers both the temples and has seventeen members on its board. There is no historical record about the temple, but there is a mention of the presiding deity Badrinath in Vedic scriptures, indicating the presence of the temple during the Vedic period (1750–500 bc). As per some accounts, the temple was a Buddhist shrine till the 8th century and Adi Shankara converted it to a Hindu temple. The architecture of the temple resembling that of a Buddhist vihara (temple) and the brightly painted facade which is atypical of Buddhist temples leads to the argument. As per other accounts, it was originally established as a pilgrimage site by Adi Shankara in the ninth century. It is believed that Shankara resided in the place for six years from ad 814 to 820. He resided six months in Badrinath and the rest of the year in Kedarnath. Hindu followers assert that he discovered the image of Badrinath in the Alaknanda River and enshrined it in a cave near the Tapt Kund hot springs. A traditional story asserts that Shankara expelled all the Buddhists in the region with the help of the Parmar ruler king Kanak Pal. The hereditary successors of the king governed the temple and endowed villages to meet its expenses. The income from a set of villages on the route to the temple was used to feed and accommodate pilgrims. The Parmar rulers held the title "Bolanda Badrinath", meaning speaking Badrinath. They had other titles, including Shri 108 Basdrishcharyaparayan Garharj Mahimahendra, Dharmabibhab and Dharamarakshak Sigamani. 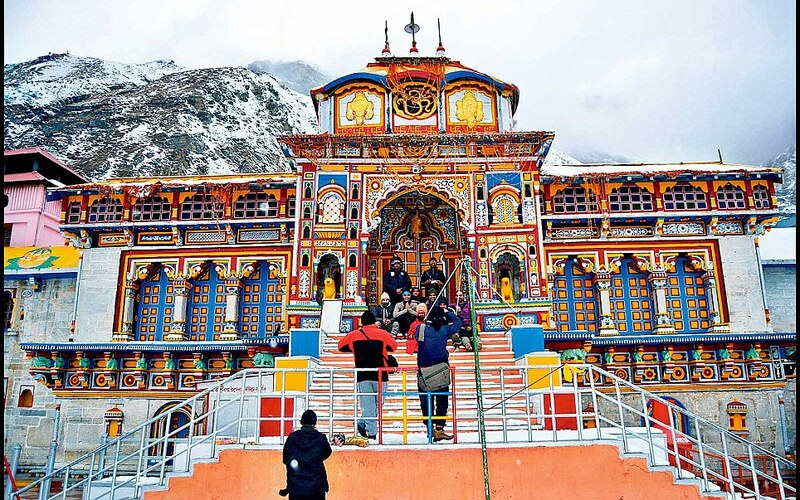 The throne of Badrinath was named after the presiding deity; the king enjoyed ritual obeisance by the devotees before proceeding to the shrine. The practice was continued until the late 19th century. During the 16th century, the King of Garhwal moved the murti to the present temple. When the state of Garhwal was divided, the Badrinath temple came under British rule but the king of Garhwal continued as the chairman of the management committee. 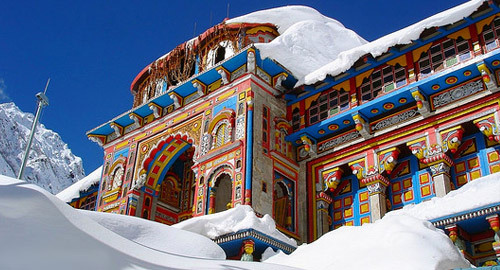 The temple has undergone several major renovations due to its age and damage by an avalanche. 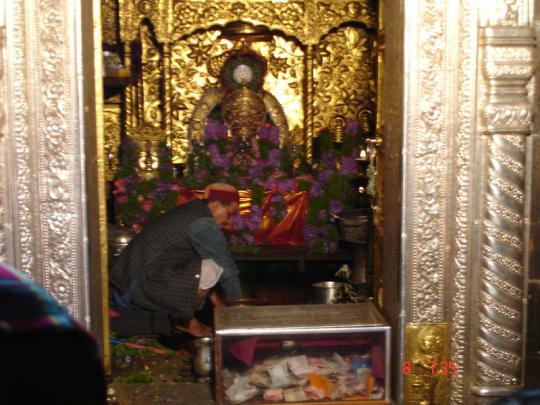 In the 17th century, the temple was expanded by the Kings of Garhwal. After significant damage in the great 1803 Himalayan earthquake, it was largely rebuilt by the King of Jaipur. It was still under renovation as late as the 1870s but these were completed by the time of the First World War. At that time, the town was still small, consisting of only the 20-odd huts housing the temple's staff, but the number of pilgrims was usually between seven and ten thousand. The Kumbh Meld festival held every twelve years raised the number of visitors to 50,000.The temple also enjoyed revenue from the rents owed to it by various villages bequeathed by various rajas. By Air: The nearest airport from Badrinath is the Jolly Grant Airport near Dehradun, about 317 km from Badrinath. By Train: The nearest railway stations to Badrinath are at Rishikesh (297 kms), Haridwar (324 kms) and Kotadwar (327 kms). Rishikesh is not connected by fast trains and Kotadwar has very less number of trains. Thus Haridwar serves as the best railway station if you are visiting Badrinath by train. Haridwar is connected by many trains from all part of India. By Bus: Badrinath is easily accessible by road. It is located at a distance of 525 Km from Delhi & 296 Km from Rishikesh. There are regular buses operating to Badrinath from Delhi, Haridwar and Rishikesh. Regular buses operate from Rishikesh bus station to Badrinath and start very early before dawn. The last bus from Rishikesh leaves for Badrinath before dawn. The road is narrow after Joshimath and travel is not permitted on the road after sunset. Therefore if one misses the bus for Badrinath at Rishikesh bus station, one has to go only up to Rudraprayag, Chamoli or Joshimath and spent the night there to take the early morning bus for Badrinath from that town. Road Connectivity: Well connected to Haridwar, Rishikesh, Dehradun, Dev Prayag, Rudra Prayag, Kotdwar, Joshi Math and other hill stations of Garhwal and Kumaon region. Haridwar – (24 km) Rishikeh – (71 km) Deoprayag – (30 km) Kirtinagar – (4 kkm) Shringar– (34 km) Rudraprayag – (20 km) Gauchar – (12 km) Karnaprayag – (20 km) Nandprayag – (11 km) Chamoli – (8 km) Birahi – (9 km) Pipalkoti – (5 km) Garur Ganga – (15 km) Helang – (14 km) Joshinath – (13 km) Vishnuprayag – (8 km) Govindghat – (3 km) Pandukeshwar – (10 km) Hanumanchatti – (11 km) Shri Badarinathji. Kedarnath to Kund (53 km route is same as given in the Route 1D chart) – (6km)Ukhimath – (22 km) Dogalbhitta – (7 km) Chopta – (27 km) Mandal – (8 km) Gopeshwar – (10 km) Chamoli – from Chamoli to Badarinathji (96 km). Route 3: KEDARNATH TO BADARINATH (247 km). Kedarnath – (14 km trek) Gaurikund – (5 km) Sonprayag – (4 km) Rampur – (9 km) Phata– (14 km) Guptkashi – (7 km) Kund – (19 km) Agastyamuni – (8 km) Tilwara – (8 km) Rudraprayag – (20 km) Gauchar – (12 km) Karnaprayag (20 km) Nandprayag – (11 km) Chamoli – (8 km) Birahi – (9km) Pipalkoti – (5 km) Garur Ganga – (15 km) Helang (14 km) Joshimath – (13 km) Vishnuprayag – (8 km) Govindghat – (3 km) Pandukeshwar – (10 km) Hanumanchatti – (11 km) Shri Badarinath. · Rishikesh to Badrinath: 301 km. 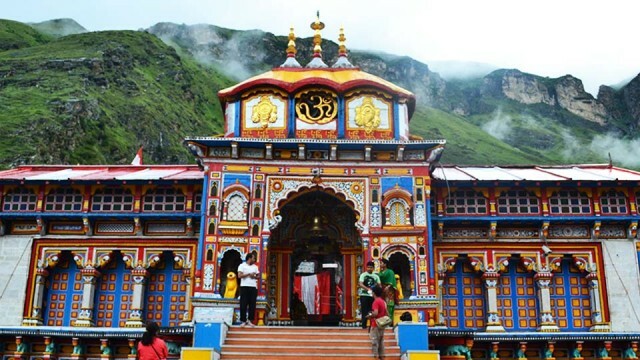 · Gaurikund (near Kedarnath) to Badrinath: 233 km. · Kotdwar to Badrinath: 327 km. · Delhi to Badrinath: 525 km. · Jaipur to Badrinath: 801 km. · Kolkata to Badrianth: 1719 km. · Pune to Badrinath: 1947 km. · Bangalore to Badrinath: 2495 km. · Auli to Badrinath: 34 km. · Valley of Flowers to Badrinath: 70 km. · Kasauni to Badrinath: 201 km. · Almora to Badrinath: 243 km. · Mumbai to Badrinath via NH-10: 1948km. There are various places of interest for every kind of visitor. While there is Swargarohini, Laxmi Van, Vasu Dhara Falls, Bheem pul, Satopanth, Tapt Kund, Panch Shila, Narad Kund, Brahma Kamal for pilgrims, at the same time there is Neelkanth Parvat and Vasudhara fall for the nature lovers. Neelkanth:- At the back of the Badrinath temple, a side valley opens to a conical shaped Neelkanth peak (6600 mt). Also known as the ‘Garhwal Queen’ is a snowy peak in the shape of a pyramid that forms the background of the Badrinath. Visitors can come up to Braham Kamal area. Satopanth:- It’s a triangular lake surrounded by snow covered peaks and is named after the Hindu gods Mahesh, Vishnu and Brahma. It is believed that Hindu gods Mahesh, Vishnu and Brahma takes bath in this Sarovar each Ekadasi of Hindu Calender. (Permission required visiting). Tapt kund: - before entering the Badrinath Temple, one has to take a holy dip in the Tapt Kund. Tapt kund is a natural hot water pool fed by a sulphur spring which is said to be the abode of Agni, the god of fire. The bathing area has separate arrangements for men and women. Although the normal temperature is 55°c, the water temperature keeps rising gradually during the day. It is considered to have high medicinal value. A dip here is considered to be a good cure for skin diseases. Brahmkapal: - near the temple, there is a place to perform Shradha of ancestors of yatris, this is an important place of Shradha where a person can perform once in his life. Charan Paduka: - It is just 3 km away is a beautiful meadow carpeted with wild flowers in the summer. Here is a boulder bearing the footprints of Lord Vishnu. Vasudhara falls: - Vasundhara Falls (3 kms from mana village) is one of the famous tourist attractions, which lies in the Mana Village. The water of this cascading falls flows down from the height of 400 ft and is situated at an altitude of 12,000 ft. It is believed that the water of Vasundhara Falls turns away from the visitors who are not pure at heart. Close to the falls are prominent peaks of Satopanth, Chaukhamba and Balkum. · Morning Pooja 4:30 to 6:30 A.M.
· Evening Aarti/ archana or path 6:00 P.M. to 9:00 P.M.
· Daily or periodical Pooja/ bhog & akhand jyoti. · Pooja on special occasions.